Homeless and at-risk veterans are getting help in a variety of ways this week thanks to a unique Bay Area program. East Bay Stand Down provides health care, clothing, legal services and more to struggling veterans. The program started Thursday and runs through Wednesday at the Alameda County Fairgrounds in Pleasanton. Organizers say the phrase "stand down" is significant. "It’s a military term for getting out of the war zone and relaxing," said Ron Lowe, executive director for the program. "Well, they get out of the war zone of the streets. "Even the pets … cleaned up, fed well and that sort of thing." Similar events are held in more than 200 cities across the nation, according to the program's website. 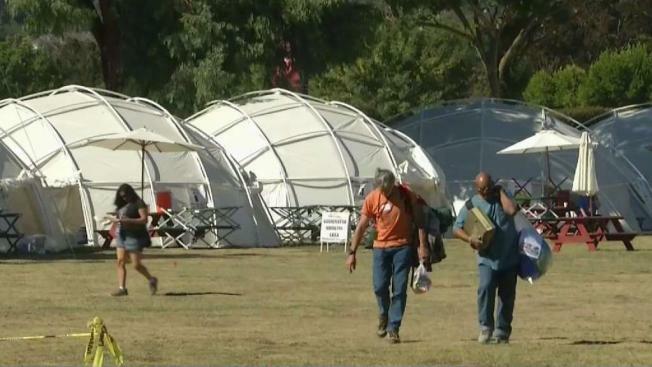 More than 1,000 volunteers took part in the program that served hundreds of veterans from around the Bay Area.